This chapter reviews the International Relations literature on globalisation and sovereignty. Using a revised version of Held and McGrew’s framework for understanding the politics of globalisation, it identifies three approaches to understanding the ways in which globalisation has affected state sovereignty: (1) Hyperglobalists, who primarily regard globalisation as a distinct ‘new’ phenomenon, which is having considerable effect, particularly on state sovereignty, with a significantly increased role for international organisations and transnational actors in key policy arenas. (2) Sceptics, who regard globalisation as not ‘new’, arguing that the state and state sovereignty remain central despite globalising forces. (3) Transformationalists, who take a middle view arguing that there are varying effects of globalisation on states exercising policy sovereignty. Chomsky, N. 2008. Anti-democratic nature of US capitalism is being exposed. The Irish Times [Online], 10th October. Available from: https://www.irishtimes.com/opinion/anti-democratic-nature-of-us-capitalism-is-being-exposed-1.894183 [Accessed 13th October 2012]. De Schutter, O. 2009. Seed policies and the right to food: enhancing agrobiodiversity and encouraging innovation report of the Special Rapporteur. A/64/170 United Nations General Assembly [Online]. Available from: http://farmersrights.org/pdf/righttofood-n0942473.pdf [Accessed 23rd February 2013]. Downes, G. 2003. Implications of TRIPS for food security in the majority world [Online]. 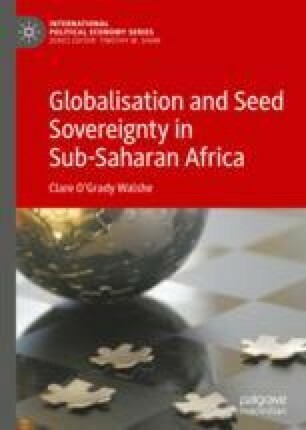 Available from: http://comhlamh.org/wp-content/uploads/2013/09/Implications-of-Trips-for-Food-Security.pdf [Accessed 10th April 2017]. ETC (Erosion, Technology and Concentration Group). 2009. Who will feed us? Questions for the food and climate crises [Online]. Available from: http://www.etcgroup.org/sites/www.etcgroup.org/files/web_who_will_feed_us_with_notes_0.pdf [Accessed 1st February 2012]. Hardt, M. and Negri, A. 2001. What the protestors in Genoa want. New York Times, 20th July 2001 [Online]. Available from: www.nytimes.com/2001/07/20/opinion/what-the-protesters-in-genoa-want.html. [Accessed 2nd December 2016]. Irish Times. 2010. Was it for this? (Editorial). The Irish Times [Online]. Available from: https://www.irishtimes.com/opinion/was-it-for-this-1.678424. 18th November 2010. [Accessed 17th October 2015]. Stevens, T. 2013. Sovereign data in international relations [Online]. Available from: http://thesigers.com/analysis/2013/11/11/sovereign-data-in-international-relations.html [Accessed 24th June 2015].